Preparation: You will need each boy to have one of the following in his pockets: a frog (plastic, unless you are brave), dirt, marbles, rocks, and a small flag. Have boys practice their parts ahead of time. Cubmaster: Have you ever wondered what boys collect and why? Let's see what we can find out tonight. Cub # 1: (pulls out frog): This frog reminds me of freedom of speech, he can croak all he wants and no one stops him. Cub # 2: (pulls out dirt): This dirt reminds me of our forefathers as they put their feet on American soil for the first time. Cub # 3: (pulls out marbles): These marbles remind me of the pilgrims as they worked and played in this new land of freedom. Cub # 4: (pulls out small flag): This flag stands for our country will you please join me in the Pledge of Allegiance? Personnel: 11 Cubs and Den Leader or Den Chief. Narrator: We would like to tell you what we collect from Scouting. Cub # 1: C: is for Courtesy. A Scout learns to do good deeds and respect others. Cub # 2: O: is for Outing. Outing is one of the most fun parts of Scouting. Camping and hiking, we always look forward to our time outdoors. Cub # 3: L: is for Learning. A Scout learns many things, first aid, knots, physical skills, citizenship and sportsmanship. Cub # 4: L: is for Leaders. One of the most important parts of the Scouting organization. Cub # 5: E: is for Exploring. A Scout learns the skills he needs to explore the outdoors. Cub # 6: C: is for Challenges. A Scout is presented with many challenges and is helped to meet them and to succeed. Cub # 7: T: is for Try. A Scout learns to always try to do his best. Cub # 8: I: is for Identify. A Scout learns to identify different kinds of leaves, trees and tracks. Cub # 9: O: is for Observe. A Scout observes the Outdoor Code whenever he goes camping or hiking. Cub # 10: N: is for Nationalism. Every Scout around the world is a patriot to his country. Cub # 11: S: is for Scouting. We are very glad Baden-Powell had the vision to bring this program into being. Cub # 1: I made a promise. I said that whatever I did, I would do the best I could. Cub # 2: I made a promise to serve my God and my country the best I could. Cub # 3: I made a promise to help other people the best I could. Cub # 4: I made a promise to obey the Law of the Pack the best I could. Cub # 5: I have done my best. I will do my best, because I am the best, I am a Cub Scout. Den Ldr: Will everyone now join us in repeating the Cub Scout Promise. Equipment: Boys come out with props to match their hobbies. Cubmaster: This month's theme is Cub Scout collectors and Den _____ is going to help open the meeting by showing some people's favorite past-times. Cub # 1: I'm always making something new, It gives me something fun to do. Perhaps I'1! make a box of wishes, But first I have to wash the dishes. Cub # 2: I like to play my favorite song, Sometimes the family sings along. I might become a music star, but first I have to wash the car. Cub # 3: I sail my ship out to the sea, A sailor's life's the life for me. To sail around the world's my dream, But after work I've lost my steam. Cub # 4: I like to golf and be outside, in my golfing cart 1 ride. A pro golf tour could be my fame, But housework comes before the game. Cub # 5: Video games are the best, 1 play better than all the rest. I could invent an awesome one, But to the school bus I must run. Cubmaster: Thank you Den _____. Everyone tike to have fun with their hobbies and collections, but as you can see, you have to do some work before you can play. Let's see how much work the Cub Scouts did this month and see how many advanced, but first we will begin with the Pledge of Allegiance. Preparation: Each Cub should have a picture of his flag with the words in large print on the back. Even better would be to have a set of historical flags to show. Don’t be afraid to change the flags talked about. If you have a 48 star flag, “Old Glory” that flew over the US during the two world wars or a “Don’t Tread on Me” flag, use it. Write your own parts. Cub # 1: One of the greatest collections is the collection of flags that have flown over our country. Let’s listen to our Cubs as they tell us about a few of these American Flags. Cub # 2: This is the British Union Flag or Union Jack. It flew over the British Colonies in North America from the landing of the first Colonists at Jamestown in 1607 and at Plymouth in 1620 until the Revolution. Cub # 3: This is the Grand Union Flag. At the beginning of the American Revolution, the colonists hoped not so much to gain independence as to correct the wrongs done them under the rule of George III. 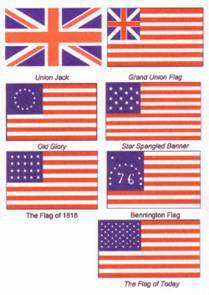 They kept the British Jack out of loyalty to the crown, but added the 13 stripes to show their own unity. it was raised the first day of January, 1776, over George Washington's headquarters. Cub # 4: This is Old Glory, the first official flag of the United States of America. It was created by a resolution of the Continental Congress. passed June 14, 1 777 - a date we celebrate as Flag Day. Cub # 5: This is the Star Spangled Banner. When two more states joined the original 13. stars and stripes were increased to 15. This flag of 1 5 Stars and Stripes flew over Fort McHenry the night of its bombardment in 1814, and inspired Francis Scott Key to write the verses of our National Anthem. Cub # 6: This is the flag of 1818. As more states joined the Union, the flag would become an awkward shape if more stripes were added. Therefore, on April 4, 1818. Congress passed a law that restored the design of the flag to 13 stripes and provided that a star should be added for each new state. Cub # 7: The Bennington Flag is of an unusual design. Although it has 13 stripes, the top and bottom stripes are white instead of red. The 13 stars have 6 points. They are arranged to form a Gothic arch over the `76' which commemorates the year American independence was proclaimed. Cub # 8: This is the flag of the USA today. The 13 stripes remind us of the original colonies The 50 stars represent the states that bound together into one country. Please stand and join us in the Pledge of Allegiance to Old Glory. Opening - Who Collects What? Equipment: This can be as simple or as elaborate as you like. The boys can wear signs around their necks showing their hobbies, or they can dress the part, with as many or as few props as you like. If you don't have enough boys, let them double up on Cub Scouts 1 through 10. In any case, the last Cub Scout (Cub #11) should be in full uniform. Cub # 1: I am a rock hound. I collect obsidian, quartz, and other minerals. Cub # 2: I am a folk singer. I collect ballads to perform and share. Cub # 3: I am a numismatist. I collect coins. Cub # 4: I am a ham radio operator. I collect post cards with the call numbers of other radio operators..
Cub # 6: I am a lexicographer. I collect words and famous historical autographs. Cub # 9: I am a railroad buff. I collect railroad timetables and other railroad memorabilia. Cub # 11: I am a Cub Scout. I collect a lot of the things already named for my achievements and electives. I also collect rank badges and arrow points as l learn and grow. I've also collected the knowledge about how to be a good citizen. Please stand and join me in the Pledge of Allegiance.